336 pages | 1 B/W Illus. While liberal-democratic states like America, Britain and Australia claim to value freedom of expression and the right to dissent, they have always actually criminalized dissent. This disposition has worsened since 9/11 and the 2008 Great Recession. This ground-breaking study shows that just as dissent involves far more than protest marches, so too liberal-democratic states have expanded the criminalization of dissent. Drawing on political and social theorists like Arendt, Bourdieu and Isin, the book offers a new way of thinking about politics, dissent and its criminalization relationally. Using case studies like the Occupy movement, selective refusal by Israeli soldiers, urban squatters, democratic education and violence by anti-Apartheid activists, the book highlights the many forms dissent takes along with the many ways liberal-democratic states criminalize it. The book highlights the mix of fear and delusion in play when states privilege security to protect an imagined ‘political order’ from difference and disagreement. The book makes a major contribution to political theory, legal studies and sociology. 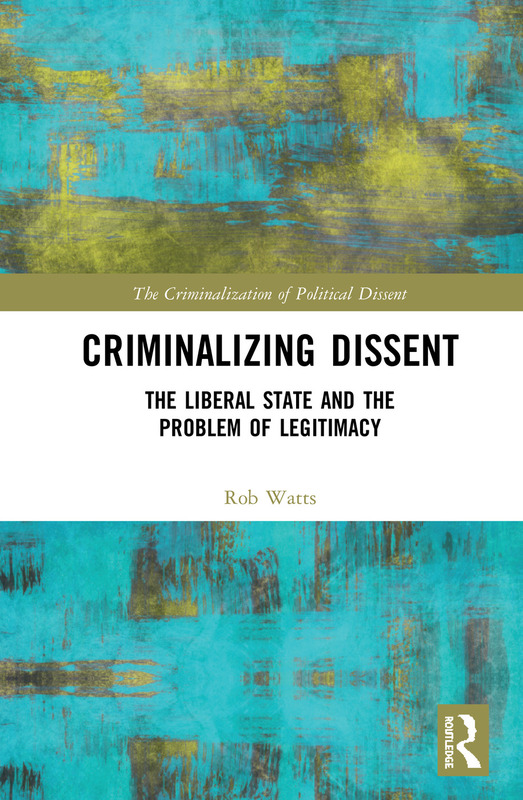 Linking legal, political and normative studies in new ways, Watts shows that ultimately liberal-democracies rely more on sovereignty and the capacity for coercion and declarations of legal ‘states of exception’ than on liberal-democratic principles. In a time marked by a deepening crisis of democracy, the book argues dissent is increasingly valuable. "Rob Watt’s Criminalizing Dissent could not appear at a more important moment. In a careful, deliberate manner, he undertakes to explain not just what dissent is and the many forms it can take in liberal democracies, but also why it is so important that we protect it. This is a timeless lesson that seems especially relevant now." Rob Watts is currently Professor of Social Policy at RMIT University where he teaches politics, criminology, policy studies and applied human rights. He was a founding member of the Greens Party in Victoria, and established the Australian Center for Human Rights Education at RMIT in 2008. His recent books include States of Violence and the Civilising Process (2016), Public Universities, Managerialism and the value of the university (2017) and The Precarious Generation: A political economy of young people (2018, co-authored). This challenging new book series explores the way governments since 9/11 from across the political spectrum intensified their efforts to criminalize both traditional and new forms of digital political dissent. The series will features major contributions from the social sciences, law and legal studies, media studies and philosophy to document what happens when governments choose to regard activists campaigning for increased government transparency and accountability, environmental sustainability, social justice, human rights and pro-democracy as engaging in illegal activities. The book series explores the legal, political and ethical implications when governments engage habitually in mass electronic and digital surveillance, outlaw freedom of movement real and virtual public assembly and prosecute digital activists. The books in this series are a ‘must read’ for anyone interested in the future of democracy.